The polling percentage was over 70. There were a few incidents of violence and allegations of booth capturing, but the day largely passed off peacefully. In short, the big day in Punjab was essentially unremarkable. In a democracy, that is desirable. The people of the state and the Election Commission deserve congratulations for this, especially given the high stakes and the blazing entry of a third entity in what everyone initially expected to be a bipolar contest. The registration of an FIR may unnerve an ordinary citizen, but not Narendra Modi, the BJP strong man whose single-minded goal in life seems to be to somehow occupy the Prime Minister's chair. The pursuit of ambition sometimes can drive one to do things one may regret later. Right now Modi sees no wrong in violating provisions of the Representation of the People's Act. IT may be fashionable among certain sections to point the money-lender as a veritable Shylock, always insisting on his pound of flesh, but the facts, even according to an Administration Report, are otherwise. The recent Punjab Land Revenue Administration Report, among other things, notices the popularity of the Punjab Redemption of Mortgages Act, 1913, which provides easy and exceptional facilities by means of a summary method to mortgagors of small holdings to redeem their land. BJP prime ministerial candidate Narendra Modi is rushing through the country, projecting the Gujarat development model which, he claims, will be applied at the all-India level so as to make India as one of the envious countries in the world. It is a different matter that a credible critic like the Peoples Union for Civil Liberties, a human rights organisation founded by Jayaprakash Narayan during the Emergency in 1975, has published a book "Truth on Gujarat Development", which shows all these claims to be false. During my posting in Chandigarh, in addition to my normal technical duties, I was assigned the job of disbursement of pension to about 700 pensioners. 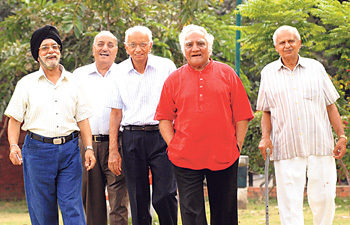 Most of them had retired from high posts. I had seen them working when they were in full command. At that time, the world seemed to be at their feet. Now, most of them had mellowed down and leading a placid and peaceful life. Top posts for the ex-brass: What’s the criteria? It is not unusual for a former service chief to be appointed as an ambassador (known as high commissioner in Commonwealth member states) to a foreign country or as a governor or lieutenant governor of a state. Thus recently retired Chief of Air Staff Air Chief Marshal Norman Anil Kumar Browne’s appointment as Ambassador to Norway, which was announced earlier this week, should not come as a surprise. The polling percentage was over 70. There were a few incidents of violence and allegations of booth capturing, but the day largely passed off peacefully. In short, the big day in Punjab was essentially unremarkable. In a democracy, that is desirable. The people of the state and the Election Commission deserve congratulations for this, especially given the high stakes and the blazing entry of a third entity in what everyone initially expected to be a bipolar contest. One incident, however, stands out as shameful and deserves condemnation by all: The brutal assault on the AAP candidate in Patiala. He alleged this had followed daylong harassment of workers of his party by SAD volunteers. This was an election that perhaps saw the biggest participation ever by the electorate in the political debate, courtesy social media. The polling day, and the day after, naturally remained agog with speculation over what happened, which way the wind blew. The only takeaway for sure is that the polling percentage was high, which should imply anti-incumbency, but in Punjab there were other factors at play too. For one, there were three very keen contenders egging their supporters to come out and vote. Another clear fact was heavy support for AAP, though no one can say what that means in terms of seats for any party. Also apparent was the excellent field management of SAD, which had people on every booth, even two stalls at one booth. In contrast, AAP had to let some booths remain unattended. The Punjab CEO has expressed satisfaction at the need to register FIRs in only four cases. While the state police and Central forces deployed in Punjab have done a commendable job under the election panel's supervision, the aim should be to have perfect elections, which means no violence or poll code violations. Punjab saw the distribution of money and minor skirmishes at many booths on the day of polling. But none of these have been officially recognised. It is going to be an impatient two weeks till the counting on May 16, both for the parties and the voter. The registration of an FIR may unnerve an ordinary citizen, but not Narendra Modi, the BJP strong man whose single-minded goal in life seems to be to somehow occupy the Prime Minister's chair. The pursuit of ambition sometimes can drive one to do things one may regret later. Right now Modi sees no wrong in violating provisions of the Representation of the People's Act. The BJP too blindly defends anything that Modi says or does. The Election Commission has visual evidence of Modi's law-breaking act of addressing a press conference and soliciting votes for his party and displaying an image of lotus, the BJP symbol. On the EC's order the Gujarat police registered two FIRs against Modi and certain TV channels that telecast the event. 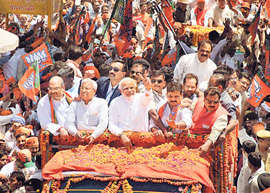 On April 24 Modi filed his nomination papers in Varanasi after leading a massive procession which was also telecast live by TV channels regardless of the fact that voters could be influenced since polling was being held in parts of India on that day. BJP opponents had demanded the registration of an FIR then too. Modi got away then and makes light of the latest offence punishable with up to two years' jail. Everyone makes a mistake but not everyone defies or makes fun of the authority that points to the wrongdoing. Here the authority is none other than the Election Commission of India, a constitutional body. Modi ridiculed it when he said: "One can understand if someone points a knife, a pistol or a gun. But do you know why an FIR was registered against me? Because I showed a lotus to people". Obviously, he has no fear of the law and believes the lotus is a sacrosanct emblem. In Punjab, Chief Minister Parkash Singh Badal has been asked to explain his conduct in urging the business community to fund his party's election campaign. The statement was made on April 12 at Jalandhar. Why has it taken the Punjab Electoral Officer so long to take cognizance of it? IT may be fashionable among certain sections to point the money-lender as a veritable Shylock, always insisting on his pound of flesh, but the facts, even according to an Administration Report, are otherwise. The recent Punjab Land Revenue Administration Report, among other things, notices the popularity of the Punjab Redemption of Mortgages Act, 1913, which provides easy and exceptional facilities by means of a summary method to mortgagors of small holdings to redeem their land. But this popularity is due no less to the co-operation of the mortgagees and the money-lenders than to the special facilities which the measure affords for redemption of lands. As the Report under notice says, "the Act is welcomed as a boon by mortgagees and very little opposition has been offered by the money-lenders." IT is understood that some form of legislation with a view to checking the mischievous results of the practice of badni has been in contemplation of both the Provincial and Imperial Governments. There can be no doubt that badni is only a form of wagering contract and under section 30 of the Indian Contract Act, all agreements by way of wagers are void. The most usual forms of badni, as prevalent in the province, are simply wagers of this nature. A certain quantity of produce of a certain kind is supposed to be purchased on a certain date at the market rate of that date, and it is to be sold on a certain forward date at the market rate of that date. If the market rate of sale date shows a profit, the nominal purchaser receives the profit, if there is a loss he pays it. No produce is delivered or intended to be delivered. Is it too much to expect that at least for the rest of the election period, let the debate be at the political level? I can understand the exaggerated claims made by Modi and the disreputable attempt by the Congress to cover up the corruption scandals and inefficiencies of the UPA government as part of a normal election strategy. But when Modi invokes God to his support in the elections, as he did recently by saying “that he has been chosen by God to rescue the country…. that God chooses certain people to do the difficult work and he believes God has chosen me for this work”, this is a statement that violates every teaching and tradition of Hinduism. Of course, I know very little of Hindu Shashtras. But I know reasonably well to assert that under Hinduism God has never enlisted a mortal to save the country or lead the nation. Rather it is sacrilegious for any Hindu mortal to claim that in worldly matters he is the chosen one by God. The Hindus’ most sacred scripture, the four Vedas, which they believe were God's spoken words, are said to have been instilled into Brahama Rishis, whose names are not even known. Hindus believe in the “Trimurti” of Brahma, Vishnu and Mahesh (Shiva). They further believe that when there is injustice, anarchy on earth, Vishnu (Avtar) comes in the garb of man to save the world. So is the story of Lord Rama, and Lord Krishna whom God gave mortal shape and then sent them to earth to carry out His work. But nowhere under Hinduism has a mortal man (I hope Modi loyalists would not contradict the mundane claim that Modi is a mortal person, like the rest of the earthly people) ever been entrusted by God direct to save the nation. More forcefully the same message and pattern runs through all the other religions. To Christians Christ was the son of God - no other Christian claims a direct contact with God. The holy Quran rejects the notion of attributing divine qualities to anyone other than God. The Quran contains narratives of previous prophets such as Adam, Abraham and Moses. Prophet Muhammad (the last Messenger of God) never claimed that God revealed to him the Quran direct. The Prophet submissiveness to God is so complete and is shown by his open declaration that it was through Angel Gabriel that God revealed the Quran to him. So Modi's claim that he has been chosen by God is sacrilegious. It is against the teachings of not just Hinduism and Islam, but of all religions. To claim such proximity to God is the most serious sacrilege. Another declaration by Modi when he went to file his nomination papers from Varanasi attributed to him says that he has not come on his own, but that he has come at the command of Mata (Mother) Ganga. It is well known that to Hindus that the Ganga is not just a river but all divinity is attributed to it. I am not going into the question whether these words amount to invoking religious appeal during the elections and a corrupt practice, thus entailing disqualification. I concede that Modi is more conversant with the Hindu religion than me who could be called an ignoramus in this context. So surely he would remember that when Bhisham Pitamah, one of the great heroes in epic Mahabharat, goes to Mother Ganga (it should be remembered that Ganga was the real mother of Bhisham Pitama, according to the epic), Ganga gets angry and tells Bhisham: 'Why do you come running to me whenever you have any problem — use your own thinking and act accordingly'. Bhisham Pitama, the real son of the Ganga, accepts this remonstration in all humility. So if Ganga, the real mother, does not want to get embroiled in worldly problems of her real son Bhisham, why would Ganga especially call Modi, who is engaged in petty worldly matters of elections? Mr Modi, why are you cheapening the divinity and the worship of Mother Ganga for whom millions of Hindus have the highest devotion and reverence? Not to be outdone, Sonia Gandhi has also invoked God to save the country from the Gujarat model. Who should God listen to because He is for all religions? Can one not expect politicians to leave God alone to look after us small mortals who have only Him to save us? In these elections, your victory is certain. But if the certainty is turned into uncertainty and ultimately to your defeat then I would be extremely happy and it would also be beneficial for the country. Then you would get the opportunity to improve yourself and become a better person. In the end, I pray for your long life so that I may get the opportunity to reform you. I am happy that a sober person like you is opposing me in the elections. I think in this election the discussion would be centred on the political programmes. Be cautious and ensure that the personal discussion should be curtailed." Later on in 1963 when Dr. Lohia was elected to the Lok Sabha and went on the first day to attend the Lok Sabha session Pt. Nehru made it a point to be present there and to personally welcome him. The moral is - good manners should not become victim of political rivalry. Is it too much to expect that at least for the rest of the election period, let the debate be at the political level and not on personal vilification? As I was the pension disbursing officer, pensioners would keep in touch with me. All of them were settled in Chandigarh, Mohali and Panchkula. Every month one or two new pensioners would arrive with their pension orders and I would ask the staff to prepare their pension files. Their number mounted every month as more and more pensioners preferred to settle in the tricity. During one's long service span, many diverse situations are often faced by a person. Pensioners too had passed through such times. Realising this, I would often share a crucial issue with them. They would come forward with instant and sincere solutions. I found that I had access to an elite brain bank with its vault full of life-time experiences. The pensioners enjoyed providing solutions as they felt valued. As I developed a close rapport with them, I noted that most of them liked to sit and have a talk. Over cups of tea, they would reminisce about the good old days. Handling the technical as well as accounts matters, I was always short of time. Yet I would listen to them patiently, unable to tell them to excuse me. I had a reason for that. Their grown-up children were posted in far-away places. Many had jobs abroad. Others were posted in the NCR or metros. They would visit their parents only on special occasions like Diwali or some family function. On weekends, their children would go to a resort for a getaway or would attend to their household jobs. Even if they visited their parents, they would spend most of their time sleeping or watching TV, leaving bags full of washable clothes to their mothers. Most of them had no time to sit with their parents and have a hearty talk. Initially, these seniors enjoyed good placements of their children as it gave them satisfaction of settling their children successfully. Slowly, not able to sit with their children when they could share their life experiences and achievements and problems in the last leg of life made them wary of the lifestyle of the new generation. Yet they never wanted to complain to their children as it would unnecessarily disturb them, they felt. The result was that they looked for someone who could willingly share a talk with them. After the departure of my father, my mother had told me how he always yearned to talk to me. He wanted to share with me his pride over his achievements and memories of the days gone by. But he never made demands on my time. Looking back, I realised how much he wanted to do that but never expressed his desire lest my work should suffer. I had wished I could turn the clock back and offer my father all the time he wanted from me to sit with him. That's why I could understand the real need of these seniors visiting me. As I paid all the time and attention to them by lending a listening ear, I prayed to God to make the young generation, caught in a whirlpool of work pressure, pause, realise the desire of their parents and spare sufficient time for them. The natural question here is whether politics, proximity, personal equations and even a quid pro quo has been at play prior to the appointment. This is an important issue because the armed forces in India are and must remain apolitical. The Congress (prior to the era of coalition governments) and the Congress-led UPA has been the primary ‘benefactor’ with the non-Congress governments under Prime Ministers VP Singh (December 1989 – November 1990), Inder Kumar Gujral (April 1997 – March 1998) and AB Vajpayee (March 1998 – May 2004) making very few such appointments. None of the short-lived governments under former Prime Ministers Morarji Desai (March 1977 – July 1979), Charan Singh (July 1979 – January 1980), Chandrashekar (November 1990 – June 1991) and HD Deve Gowda (June 1996 – April 1997) have assigned a post-retirement diplomatic or gubernatorial posting to a retired service officer. However, rarely did they rescind any such appointment made by the preceding government on taking over reigns. The decision to appoint retired defence service officers primarily raises two questions. First, whether or not any criteria is adopted before making such appointments and, if so, what is that criteria? Second, whether retired defence officers, especially retired service chiefs, should be indiscriminately seeking and accepting such positions? Whenever a service officer is assigned a diplomatic or gubernatorial position, it is bound to attract attention. The reason: both of these are political appointments made by the government of the day considering that armed forces officers do not belong to the Indian Foreign Service (IFS) where such appointments are part of the job description. Nor are defence officers politicians or civil administrators who would be considered naturals as governors. This means that every such appointment of a retired defence officer involves special deliberation by the government. The question that arises here is whether politics, proximity, personal equations and even a quid pro quo has been at play prior to the appointment. This is an important issue because the armed forces in India are and must remain apolitical. If the reason for such appointments lies in criteria other than either merit or competencies of the officer unique to the post to which he is being appointed, then it contributes to politicising the senior hierarchy of the services and making them susceptible to professional compromises. For example, why are some officers given diplomatic or gubernatorial assignments and others not? Why are sometimes officers with questionable records accorded such appointments and officers with proven credentials not considered? An Army Chief (General PN Thapar), who resigned following India’s defeat in the 1962 Sino-Indian War was appointed Ambassador to Afghanistan as was another Army Chief (General JN Chaudhuri) who, despite recommending what would have been a military blunder had the Indian forces withdrawn to Beas during the 1965 Indo-Pak War which in turn would have permitted the Pakistani Army to encircle Amritsar, was posted High Commissioner to Canada. Lt General Harbaksh Singh, who successfully blunted the Pakistani armour thrust in Khem Karan (Punjab) was never given a post-retirement assignment. Neither were Field Marshal Sam Hormusji Framji Jamshedji Manekshaw nor Lt General Jagjit Singh Aurora who commanded the Indian Army and the Army’s Eastern Command, respectively, during India’s resounding victory over Pakistan in the 1971 war, given such posts. General GG Bewoor, who was especially given an extension to be made Army Chief after superseding Lt General Premindra Singh Bhagat, was later appointed Ambassador to Denmark. More recently, Admiral Sureesh Mehta, who was Navy chief when the 26/11 terror attacks took place in Mumbai following the breach in India’s coastal security, was made High Commissioner to New Zealand. Then again, former Army Chief General JJ Singh was appointed Governor of Arunachal Pradesh only to be succeeded by a lieutenant general (Nirbhay Sharma) who has never even headed an operational command and has already served a full term as member of the UPSC. Similarly, two Army Chiefs (General OP Malhotra and General SF Rodrigues) were appointed governor of Punjab as was also a lieutenant general (BKN Chibber) who had never previously even commanded an operational command. Another Army chief (General VK Krishna Rao) was appointed governor in then ULFA violence-afflicted Assam but so was subsequently a lieutenant general (Ajai Singh), an armoured corps officer, who had never previously headed an operational command. Again, two former Adjutant Generals (Lt General KM Seth and Lt General MM Lakhera), with no previous experience of heading an operational command, were appointed governors of Nagaland/Tripura and Puducherry/ Mizoram respectively and yet several army commanders who have served in the North -East were never considered. Lt General SK Sinha, who was superseded to the post of army chief during the Congress regime headed by late Prime Minister Indira Gandhi, was given three assignments in a row by three successive political dispensations only to be subsequently upheld by a fourth. He was appointed Ambassador of Nepal by the VP Singh government, Governor of Assam by the IK Gujral government and Governor of Jammu and Kashmir by the BJP-led NDA government which, in turn, was upheld by the UPA-I government. The list of examples are many and the questions and inferences seemingly endless. The next issue is whether service chiefs and senior retired officers should be indiscriminately accepting such positions. The Indian Army, Navy and Air Chiefs, respectively, command the world’s third, fourth and seventh largest respective force and are equivalent to the cabinet secretary in the warrant of precedence. They command material assets worth thousands of crores, lead the country in wars, in military operations other than war, in aid to civil authority and in international diplomacy and, when called upon, render advice on issues concerning national security to the country’s highest authorities. 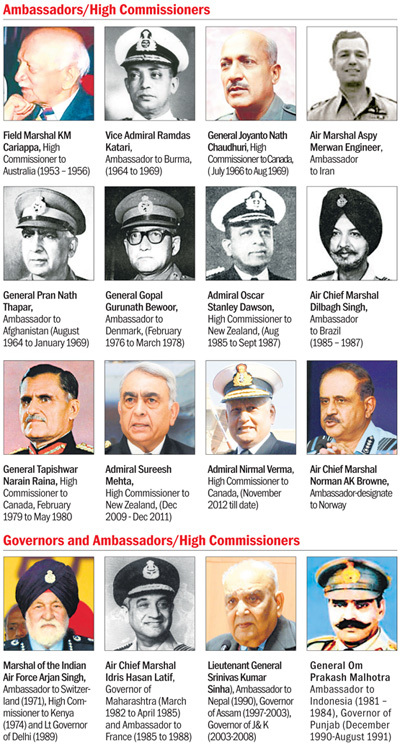 Yet why would a retired service chief be willing to accept an ambassadorial post to a country where the Indian mission comprises less than half-a-dozen officers in tiny and, from an Indian point of view, relatively less significant countries such as Norway, Denmark or New Zealand where, again, the post of ambassador is usually held by an IFS officer of a joint secretary / additional secretary rank, which is two to three notches below a service chief? Is it because the service officers are being ‘accommodated’ or ‘rewarded’? Or, is it because in most cases retired service chiefs are not considered worthy of being given relatively more significant countries? Or, is it both? The bottom line is that in the absence of any transparency or laid down criteria, such decisions will always be open to both speculation and questioning, which in turn is fraught with having an unhealthy effect on the services. What is needed is for the government to develop a definitive criteria for selecting retired service officers for such posts. Perhaps, for example, a retired Army Chief with appropriate skills and credentials may make an ambassador to a military-junta run Myanmar; a retired Navy Chief could make an ambassador to an important littoral state; an outstanding commander of an operational command or a corps who has done well in counter-insurgency operations may do well as a governor of an insurgency afflicted state for a limited period and purpose, and so on. The Indian Armed Forces are a repository of a wealth of experience and skills. Prudence lies in recognising talent and utilising it appropriately. A clear criteria, transparency and meritocracy is needed rather than the likelihood of rewards for services rendered, proximity to or sycophancy of powerful politicians and bureaucrats holding key positions. The recently retired Chief of Air Staff Air Chief Marshal Norman Anil Kumar Browne is the fifth former air chief and the fifteenth retired service chief to be posted overseas as a head of mission. Neither Field Marshal Sam Hormusji Framji Jamshedji Manekshaw , nor Lt General Jagjit Singh Aurora who commanded the Indian Army and the Army’s Eastern Command, respectively, during India’s resounding victory over Pakistan during the 1971 war, were given such positions.